In what will likely come as a surprise to even the most jaded of San Francisco's pedestrians, cyclists, and drivers, we learn via a Department of Public Heath report that half of all the injuries treated in SF General Hospital are a result of traffic collisions. The Examiner picked up the report, which covers 2012 through 2014, and noted that treatment of those injuries ended up costing around $30.5 million a year. Of the more than 4,000 patients observed, injured pedestrians required 44 percent of the annual treatment expenditures. Next came motorists (drivers or passengers) at 22 percent, followed by motorcyclists at 18 percent, and cyclists at 16 percent. 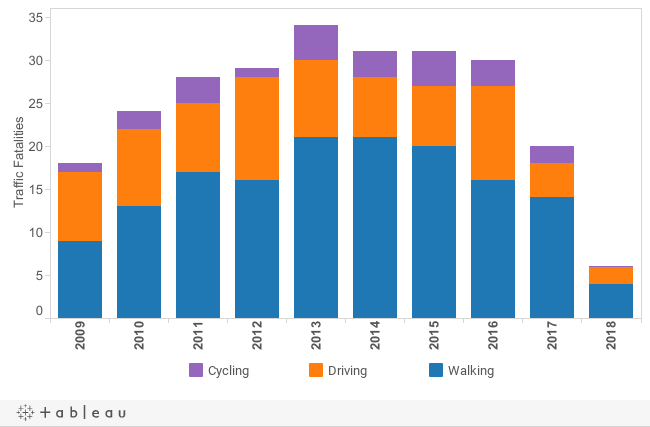 That, according to the DPH study, traffic-related injuries outpace “all other categories for cause of injury including falls, cuts/pierces, firearms, and assault” does not sit well with pedestrian-advocacy group Walk SF. “We’re astounded to learn that half of all San Francisco trauma victims are transportation-related traffic crashes,” Walk SF executive director Nicole Ferrara told the Ex. This report casts new light on Vision Zero and the effort to reduce traffic fatalities on city streets to zero by 2024. By focusing on the number of traffic-related deaths, as opposed to all injuries, it is perhaps too easy to overlook the true scale of the danger people face navigating San Francisco streets. “This analysis puts into perspective the pervasiveness of traffic crashes in our society and the urgent need to invest in proven strategies to prevent crashes,” Ferrara told the paper. According to city statistics, around 30 people die and 200 are "seriously injured" on San Francisco streets each year. Although, as the below SF Gov chart shows, the 2016 fiscal year has tragically surpassed that number of deaths.